It's me again! looks like I'm the posting lady today hehehe sorry for so many questions but I just love this place!!!!! I know my grandma would LOVE your stuff but she's not computer friedly ya know? So I wondering do ya'll have a printed catalog I could order for her? If ya'll do how do I get one? Re: Lucky Mojo Printed Catalogue? Its on our list of things to get done this year, but we can't promise any sooner then that. We sell a LOT of items and thus the catalog is quit big and takes time to update and print. I am hoping to be able to put the full catalog up as a PDF file, so that it can be printed out by customers themselves. Just bare with us as we get through all the things we need to do. I think a PDF catalog is a great idea! I know my grandma would LOVE your stuff but she's not computer literate. I wondering do ya'll have a printed catalog I could order for her? If ya'll do how do I get one? I am sorry, it has been more than ten years since we put out our last printed catalogue. I would suggest that if you have a colour printer, you could go to our individual catalogue pages -- such as the oils page, the incense page, etc. -- and print them out for her. Another option would be to loan her an ipad or or smart phone or something similar so she can scroll around and look at the items. She can then write down what she wants and order by mail -- we do have a lot of clients who send money orders or cash by mail. You could ask her what type of products she wants and order them for her. If she lives nearby, invite her over so she can look at the items on your computer. I was going to ask about a printed catalogue. I remember receiving a printed catalogue in the early to mid-90s that sold an oil, an incense, and a powder of the same fragrance together in a little wicker basket, usually filled with shredded paper that looked like Easter grass. I don't remember the name of the company. Was that Lucky Mojo? I haven't thought of that in years, and only just remembered it today when I was looking at the 'Q' products. 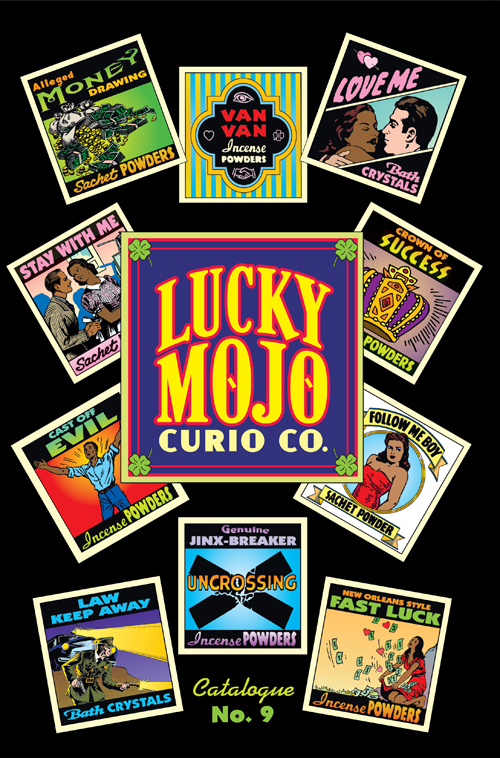 Nope, although the Lucky Mojo Curio Co. has been around since the 1990s, and we did publish a printed catalogue for years, we never sold products in little wicker baskets filled with shredded paper. We are not that cute by half.